This site has been having some fun (see here, here, and here) with some of the more extreme examples of California's Proposition 65 warnings (as has Overlawyered.com). The latest example came on a potato-peeler that I purchased (more Passover preparation) not in California but in New York City. 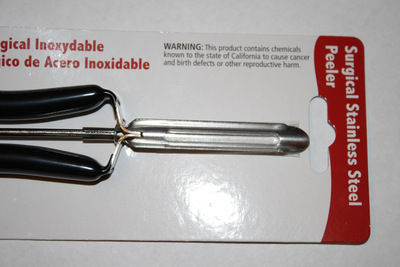 The label on the front of the package says "Warning: This product contains chemicals known to the state of California to cause cancer and birth defects or other reproductive harm." That's a heavy-duty warning. Not quite scary enough to deter me from buying the potato-peeler, but enough for me to telephone the manufacturer in an attempt to ascertain just how menacing the potato peeler was. The customer service representative assured me that "unless you chew on those handles, you're in no danger." She said she had one at home, and that neither she nor her children has come down with cancer. There's got to be a better way to approach the risks of chemicals than to slap these alarmist labels on so many products that they wind up being widely ignored.